This page contains information about the Irish university system and the research performance of Ireland. We have made every effort to ensure that the information shown is accurate. However, we welcome feedback and suggestions for additions and corrections (please contact us at info@irishscientists.org). During the period 2003-2011, the number of publications from researchers in Ireland increased sharply. 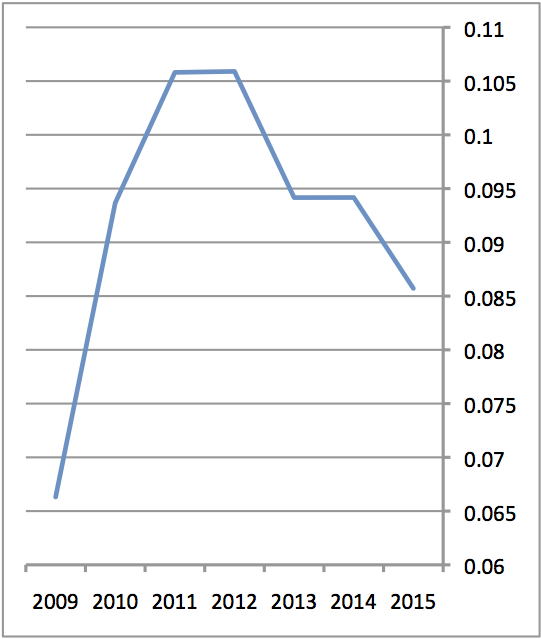 In 2012, this increase abruptly stopped and the publication output has remained fairly constant since (see Figure 1). Because the number of publications world-wide increases steadily, the stagnate publication output means that Irish research has lost ground internationally in recent years (see Figure 2). This reduction in "impact" is especially apparent when articles funded by Science Foundation Ireland are considered (see Figure 3). Figure 1: Number of articles published by reseachers from Ireland. 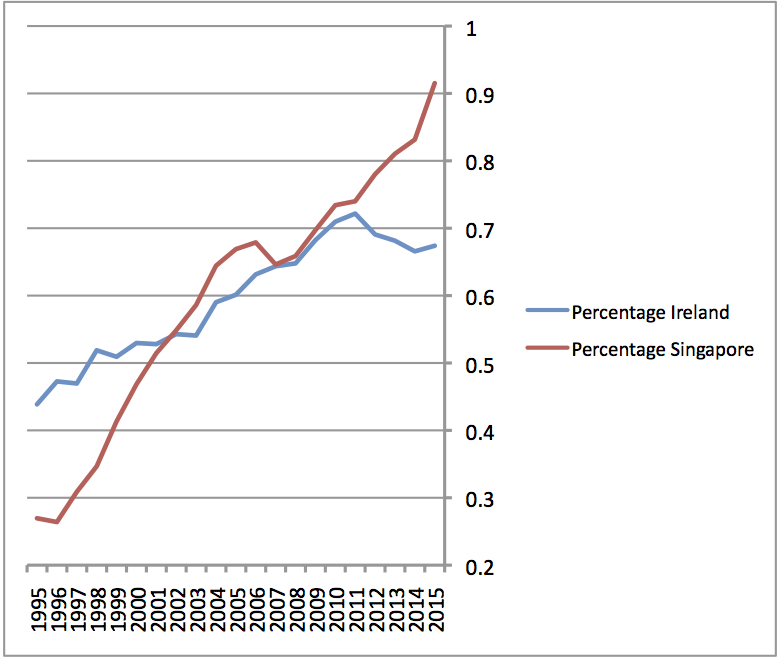 Data for Ireland (in blue) and, for comparison, Singapore (in red) are shown for a 20-year period (1995 to 2014). Note the strong increase in publication numbers for Ireland between 2003 and 2011 (largely in sync with Singapore) and the flattening of the curve after 2011. Articles in the Web of Science Core Collection dataset with an address in either Ireland or Singapore were included in the analysis. Figure 2: Contribution of Ireland to international research. 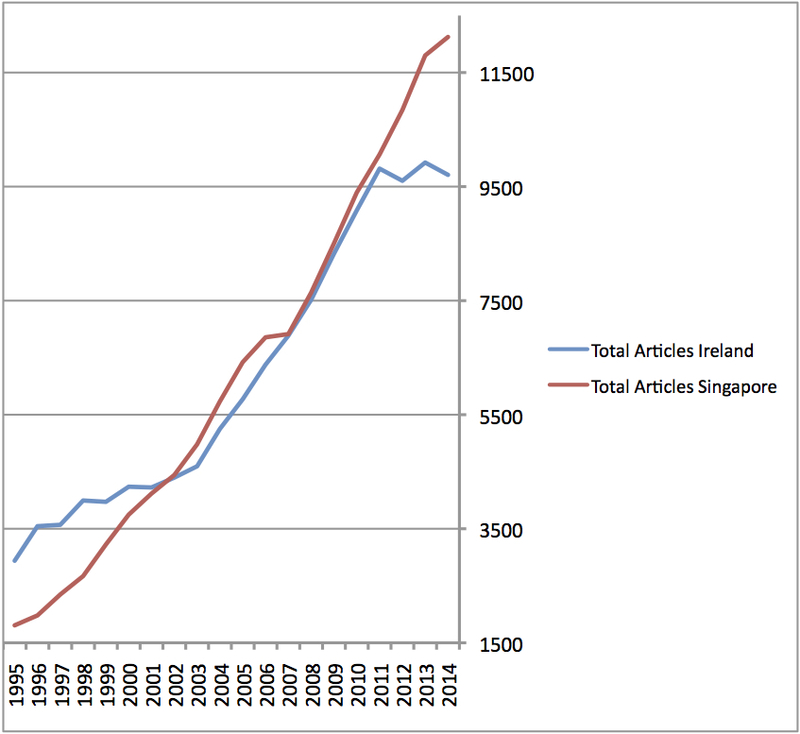 The percentage of articles published by researchers with an address in Ireland (in blue) or, for comparison, Singapore (in red), relative to the number of articles published world-wide is shown for the period from 1995 to 2015. The values for 2015 are based on articles included in the Web of Science Core Collection dataset on May 12, 2015. Figure 3: Contribution of SFI-funded articles to international research. The percentage of articles listing "Science Foundation Ireland" as a funding source relative to the number of articles published worldwide is shown for the period from 2009 to 2015. The value for 2015 is based on articles included in the Web of Science Core Collection dataset on May 12, 2015. According to the Minister for Jobs, Enterprise and Innovation (Mr. Richard Bruton, T.D.) "The number of technologies licensed to industry, which is one of the most relevant indicators of commercialisation performance in the research system, rose significantly from 12 in 2005 to 139 in 2013 and invention disclosures and spin outs also increased substantially during that period" (source). This is perhaps the best evidence so far to show that the previous research funding policy, which was in place until 2012, had significant economic impact. No Irish university is currently ranked in the Top 50 in the world and only Trinity College Dublin is ranked in some league tables within the Top 100 (see Table 1). Table 1: Current ranking of Irish universities. Table 2: Quacquarelli Symonds (QS) rankings of World Universities. 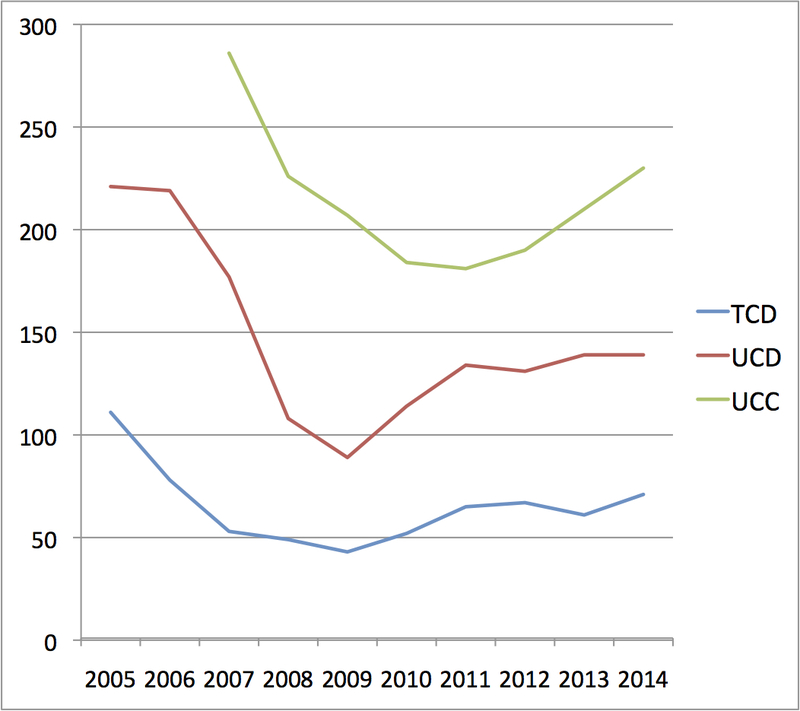 Data for Trinity College Dublin (TCD), University College Dublin (UCD) and University College Cork (UCC) are shown for the period 2005-2014. Note that from 2004-2009, the QS rankings were jointly conducted with the Times Higher Education using QS methodology, which is based on six indicators that contribute differently to the overall score: Academic reputation (40%); Employer reputation (10%); Faculty/student ratio (20%); Citations per faculty (20%); International student ratio (5%); International staff ratio (5%). "? ": unknown, but not in Top 200. 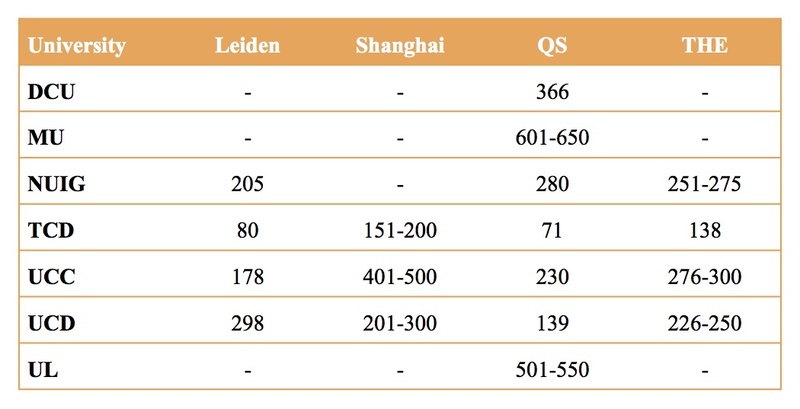 Figure 4: Quacquarelli Symonds (QS) rankings of World Universities. Positions in ranking (data as in Table 2) for Trinity College Dublin (TCD), University College Dublin (UCD) and University College Cork (UCC) are shown for the period 2005-2014. Table 3: Times Higher Education (THE) rankings of World Universities. Data for Trinity College Dublin (TCD), University College Dublin (UCD) and University College Cork (UCC) are shown for the period 2010-2014. "? ": unknown, but not in Top 200. The THE methodology is based on 13 indicators that contribute differently to the overall score. 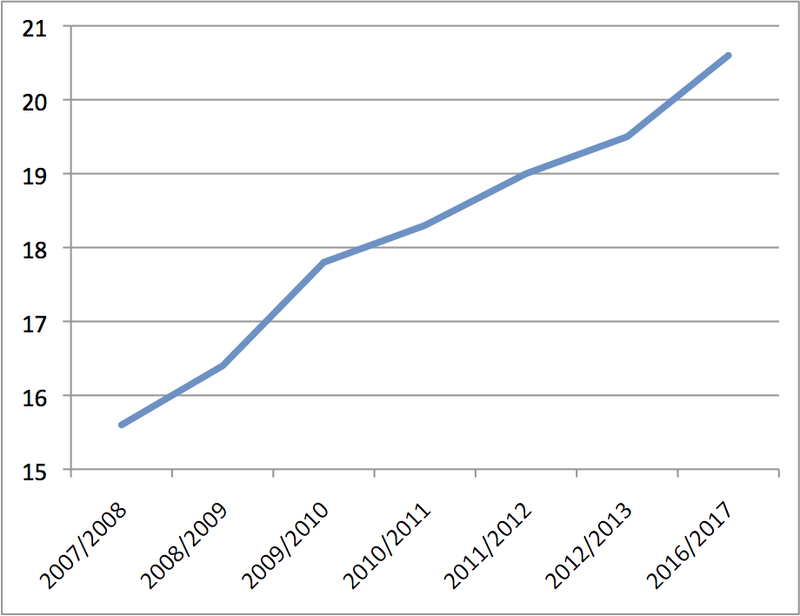 Student numbers at Irish universities have increased by about 15% between 2007/08 and 2012/13. They are projected to increase further until at least 2016/17. During the same period, the number of academic staff members has decreased by about 10%. As a consequence of the above, the staff/student ratio has worsened from about 1:15.6 in 2006/2007 to 1:19.5 in 2012/2013. It is projected to further increase to almost 1:21 by 2016/17 (see Figure 5). Figure 5: Average number of students supervised per academic. Data for the academic years 2007/2008 to 2012/2013 are shown. The value for 2016/2017 is an estimate from the Higher Education Authority. The state grant to the universities dropped from €1.397 billion in 2007/08 to €895 million in 2014/15 - a reduction by 35%. Exchequer funding as a proportion of total funding dropped from 76% to 56% over the period 2008 to 2014. It is set to decline further to 51% by 2016. Income from student contributions (i.e. fees) increased from €91 million in 2007/08 to €382 million in 2014/15 - an increase by over 300%. Between 2008 and 2014, the total income per student decreased by 22%. Expenditure per student has declined by 15% in the five years to 2013. It is projected that expenditure per student will have declined by 20% over the eight years from 2008 to 2016. Capital funding of the universities dropped from €155 million in 2008 to €35 million in 2014 - a reduction by almost 80%.